With its 2,715 meters, the Col de la Bonette scores a 4th place in the list of paved “passes”. 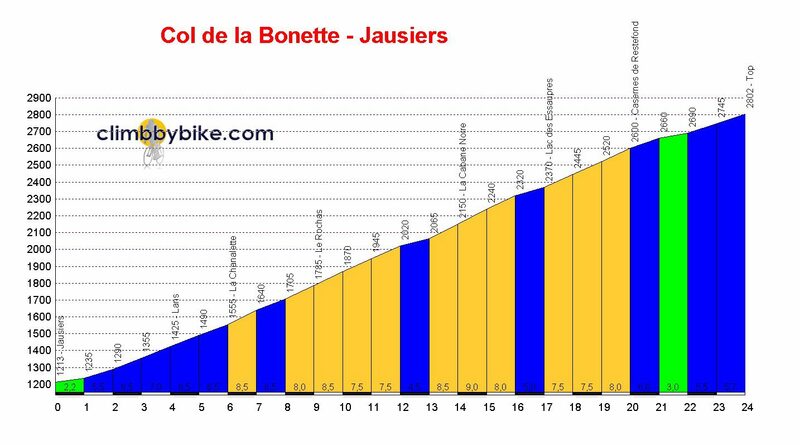 Not high enough for some, so an additional loop around the top, the “Cime de la Bonette”, was cut out of the rocks and that takes you to 2,802 meters. Report on my 2014 trip up both ends here. During my Tour de France of 2014, we rented a cottage at the foot of the Bonette, La Mexicaine in Jausiers, which I highly recommend! Not only this col, but also the Larche and the Vars are around the corner. This ascend was the first on the list of that week. It’s part of the ‘Brevet des 7 Cols de l’Ubaye’ also, and because of its length perhaps the most feared on that list. Personally, I had (a lot) more trouble with the Col de Vars. Up to La Chanalette, the grades are “easier” – in the bottom half of that part, you’ll find some stinging section, but it never gets really steep. Gradually, the views become more beautiful, the hairpins more attractive. After some 17 kilometers you ride past a lake and a few kilometers further – about two kilometers from the summit – you pass the Caserne de Restefond, part of the Maginot defense line. This is around the 2,550 meter mark. Once you arrive at the pass, you will not be able to resist the temptation and ride the extra loop, if only for the even better views. I was forced to ride over the left side, because the “natural” route over the right was still blocked by snow. Similar to the climb from Jausiers, in both length and average grade, is the climb from Saint-Etienne-de-Tinée. You first get to ride through a more “forestry” part, meandering along the river la Tinée. Just after some 10 kilometers, you will most likely have to get out of the saddle, because the following stretch of about five kilometers has some rather annoyingly steep sections. And also from this end, you’ll pass a former barracks complex, the Camp des Fourches, part of the same Maginot defense line, where the “Diables Blues” were housed. Not long after that, you reach one of the best viewpoints, marked by an Obelix in honor of General Jacquemot – the view down into the valley is absolutely stunning. Picture taken at pass height: left to Saint-Etienne-de-Tinée and right to Jausiers, in the middle, the loop ‘Cime de la Bonette’.